I love math. It wasn’t my favorite subject in school, but over time, I have come to appreciate its use in understanding complex problems. Take leads conversion. I know what you are thinking – sales and math? Read on, because I have one equation that explains why your leads don’t convert. Our experience, based on conversations with our customers, suggests that the equation below sums up the sales funnel pretty well. Didn’t that have something to do with picking red marbles and green marbles from a bag? Yes, the very same, and here’s how it’s applicable to your sales funnel. The prospect must have a need for your product or solution area, i.e. probability that the customer will buy. You can convince them to buy your product i.e. the efficiency of your go-to-market (GTM) engine. Now the first factor is outside your control – either the prospect has a need or she doesn’t. The second factor is entirely a function of your organization. Whether you can close a hot lead depends on the strength of your sales and marketing machine. That’s why the equation above is so powerful. It helps you identify whether the problem with your lead conversion is external or internal. To explain this in another way, consider the matrix below. The matrix is a visual representation of the equation – it segments organizations based on the quality of the internal and external factors. All teams fall in one of the four quadrants. Challengers: This is an organization where the sales engine is well run, but is fed bad data. Companies in this quadrant close deals solely on the strength of their execution, turning bad data into good results. But they are operating below their capacity. Also-ran: Organizations in this corner have nothing going for them. They may have poor leads, a weak GTM machine, consistent losses, and a declining market share. Contenders: This box is more hopeful; the team is getting great leads. If they can improve their sales and marketing engine, conversions would improve. 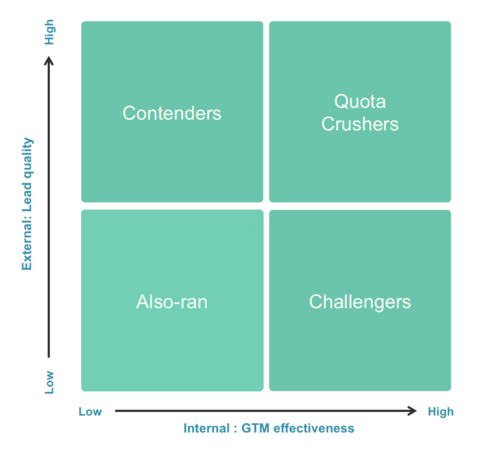 Quota Crushers: Finally, this is the quadrant that most organizations aspire to – great leads coupled with solid execution. Organizations in this corner consistently outperform their peers and gain market share at the expense of others. Now, the question is how do you separate external and internal factors. First, the lead quality: Is your team rejecting a large number of leads as cold? If so, dig into the reasons. For instance, if your sales team hasn’t had success in connecting with the decision makers despite repeated tries, or if the leads turn out to be dead-ends once a contact is made (too late, no project underway) then you can chalk it up to poor data. However, giving up on a lead after a few tries shows a lack of persistence, not poor lead quality. Next, the internal factors: Are your marketing and sales teams aligned on the definition of a qualified lead? What is your company’s market share in its segment? If your products have 20% share in its segment, it is unreasonable to expect 40% conversion from hot leads. Thinking through these questions will help you identify the gaps in your GTM machine. It may seem a tad simplistic, and having a clear delineation may not be possible, but the framework above will help you ask the right questions. This is an edited version of a previous post, which was published on 25 March 2014.